This is a very interesting novel that I could class as a coming-of- age story more than a psychological thriller but no matter what classification you put it into, it's a great readable story. Everything We Lost is told in alternating chapters by Lucy in present day (10 years after her brother disappeared) and Nolan's voice is from 10 years earlier. Lucy and Nolan had been close when they were younger but as they became teenagers, their closeness disappeared as Lucy became involved with her friends and Nolan became involved in the study of UFOs and his belief that they really existed. Once Lucy decides that she needs to try to find out what really happened to her brother, her life suddenly gains purpose after years of confusion. I thought that this was a very interesting book to read. I think that someone with great interest in UFO's would really enjoy it as there is a lot of information on the subject. I know I learned a lot while reading this book. Now on the tenth anniversary of Nolan's mysterious disappearance, Lucy is still struggling with guilt and confusion--her memories from that period are blurry and obscured by time, distance, and alcohol. Now an adult, she's stuck in a holding pattern, hiding out at her father's house, avoiding people, and doing whatever she can to keep herself from thinking about Nolan. But when a series of unsettling events leads Lucy back to Bishop, she is forced to reconcile with her estranged mother and come to terms with the tangled memories of her past to discover what really happened to her brother all those years ago. Told in Lucy and Nolan's alternating voices, Everything We Lost is a psychological mystery exploring family, beliefs, obsessions, the nature of memory, and fear of the unknown--a haunting, compelling story that will resonate with readers long after the last page is turned. Valerie Geary is the author of Crooked River, an Oregon Book Award Finalist and Indie Next Great Read. Now out in paperback! 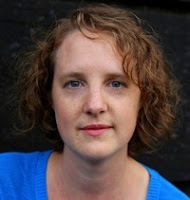 Her short stories have appeared in The Rumpus, Day One, Menda City Review, Boston Literary Magazine, Foundling Review, the UK publication Litro, and others. 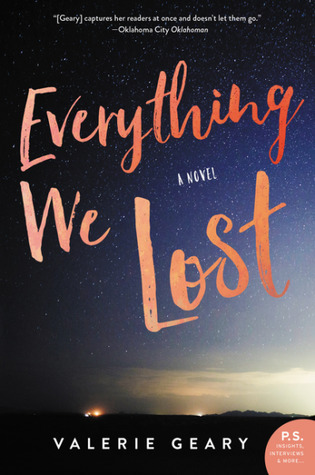 Her second novel, Everything We Lost will be released in August 2017. She currently lives in Portland, Oregon with her husband. In addition to writing, reading, and all things chocolate, Valerie enjoys gardening, hiking, sailing, cycling, and playing disc golf. I love books that touch on UFO mysteries. This sounds like a winner. I'm headed to amazon now!